One of my favorite Seinfeld episodes was the one where Kenny Roger's Roaster moved in next door, complete with a giant neon chicken sign that ends up keeping Kramer up all night. Kramer proceeds to start a protest, but gets addicted to Kenny's chicken. Ok, I'll get to the point. In one of the best lines of the show, Jerry busts Newman getting takeout for Kramer. The inclusion of broccoli in the meal gives Newman away. Jerry responds with "Broccoli? Newman, you wouldn't eat broccoli if it were deep fried in chocolate sauce". Well, Newman may not eat even eat broccoli deep fried in chocolate sauce, but I am pretty sure he would eat this grilled broccoli! Grilling broccoli creates a great flavor when the heads of broccoli start to char during roasting. There are a few important steps to follow to make sure they are as tender as possible, so let's take a look at the technique in detail. 1Fill a large pot with water and bring to a boil. 2Fill a large bowl with ice and water. 3While the pot is heating up, wash the broccoli and then carefully slice off the outside "bark" of the stalks. Many people cut the stalks off completely, but they are actually the most fought over piece of the vegetable in my house. The trick is to slice off the outside to expose the heart of the stalk. 4Slice each head of broccoli in half, length-wise. 5Once the water has come to a boil, carefully place the stalks of broccoli in the boiling water and cook (blanch) for 3 minutes and then immediately submerge the broccoli in the cold water to stop the cooking process. 6Place the blanched broccoli in a strainer and allow to dry for a few minutes. 7While you wait, fire up that grill for indirect grilling by turning one half of the burners to high and leaving the other burners off. Obviously, if you are using a charcoal grill pile up the coals to one side. 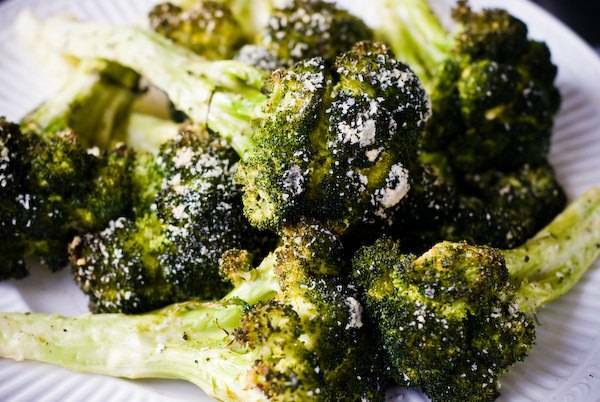 8Brush each broccoli stalk with olive oil and then immediately sprinkle with the cheese and a little salt and pepper. I like to sometimes dip the heads of broccoli in the oil and then dip into the cheese to get "snow in the trees". 9Place the broccoli on the "off" side of the grill and close the lid. 10Let the broccoli roast on the grill for 15 minutes and then test the doneness on one of the heads. Remember, every time you open the lid, you are letting all of the heat out, so keep it closed. 11Continue to grill the broccoli with the lid closed until you hit your desired doneness. It usually takes mine 20 minutes, but some people like it more or less crispy. 12Serve with the extra cheese. It was alright, but not perfect, as it still tasted like broccoli even through the spice.